Tag line: "You'll Shriek At These Shieks!" 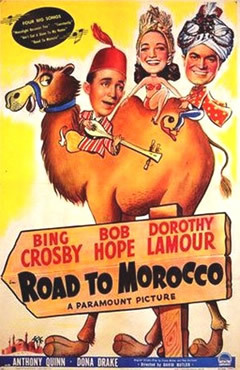 Road to Morocco was the 3rd in the series of Road movies that starred Bob Hope, Bing Crosby and Dorothy Lamour, and is easily the most popular of the bunch. From start to finish, the film is chock full of hilarious moments, and despite its Moroccan setting (recreated, naturally, on a sound stage), the focus is never once taken off the humor. In fact, the most appealing aspect of Road to Morocco is that not one single, solitary scene is ever taken seriously at all. As the movie begins, good pals Jeff Peters (Crosby) and Orville ‘Turkey’ Jackson (Hope) are drifting across the Mediterranean on a raft, stranded at sea after the boat they stowed away on exploded. Once the two make it to dry land, they hop the nearest camel and head off in the direction of Morocco. When they arrive at their destination, Jeff, in a fit of hunger, sells Turkey to a slave broker in exchange for food money. But it’s actually not as bad as it sounds, because Turkey winds up working in the royal palace as a slave to the beautiful Princess Shalmar (Lamour), who's asked Turkey to marry her. Turkey’s happiness is short-lived, however, because he learns a foul-tempered desert chief named Mullay Kassim (Anthony Quinn) also intends to marry the Princess, and as Turkey quickly discovers, Kassim isn’t accustomed to coming in second to anyone. ‘cause we’re signed for five more years. I believe it was Charlie Chaplin who once said, “All I need to make a comedy is a park, a policeman and a pretty girl”. Thanks to the classic give and take of Hope and Crosby, Road to Morocco didn’t even need that much. Hell...they didn’t even need Morocco! I do hope the fact that this is tagged with its own category means you'll be tackling the other 'Road' films; apart from 'Singapore' and 'Hong Kong' (sorry, Asia) I think they're pretty much all on a par, though maybe Morocco scrapes it. 'Bali' has most of the best songs, although the trio version of 'Moonlight Becomes You' here is a lot of fun.